Yes, Genetically Modified Organisms and anything that Monsanto develops—such as Roundup—are ticking time bombs. All of the evidence below points to the need to establish community organic gardens and individual organic gardens. I’m starting my own this summer with NON-GMO Seeds! See info here for an excellent company that assists with Organic Gardening. Home Depot also has several home-gardening kits and structures. NaturalNews) There is a conspiracy of selling out happening in America. Politics and personal interest it would seem determine government policies over and above health and safety issues. When President Obama appointed Michael Taylor in 2009 as senior adviser for the FDA, a fierce protest ensued from consumer groups and environmentalists. Why? Taylor used to be vice president for Monsanto, a multinational interested in marketing genetically modified (GM) food. It was during his term that GMO’s were approved in the US without undergoing tests to determine if they were safe for human consumption. Top produce items on the list: Corn and tomatoes. Yikes! I’m going to grow my own, or buy organic/Non-GMO. Unfortunately food companies are not required by law (yet) to label Non-GMO but there will come a time soon when they are. Unfortunately large food megalopolies have lobbyists preventing labeling legislature. 1. Corn – Corn has been modified to create its own insecticide. The U.S. Food and Drug Administration (FDA) has declared that tons of genetically modified corn has been introduced for human consumption. Monsanto has revealed that half of the US’s sweet corn farms are planted with genetically modified seed. Mice fed with GM corn were discovered to have smaller offspring and fertility problems. 2. Soy – Soy has also been genetically modified to resist herbicides. Soy products include soy flour, tofu, soy beverages, soybean oil and other products that may include pastries, baked products and edible oil. Hamsters fed with GM soy were unable to have offspring and suffered a high mortality rate. 3. Cotton – Like corn and soy, cotton has been designed to resist pesticides. It is considered food because its oil can be consumed. Its introduction in Chinese agriculture has produced a chemical that kills cotton bollworm, reducing the incidences of pests not only in cotton crops but also in neighboring fields of soybeans and corn. Incidentally, thousands of Indian farmers suffered severe rashes upon exposure to BT cotton. 4. Papaya – The virus-resistant variety of papaya was commercially introduced in Hawaii in 1999. Transgenic papayas comprised three-fourths of the total Hawaiian papaya crop. Monsanto bestowed upon Tamil Nadu Agricultural University in Coimbatore technology for developing papaya resistant to the ringspot virus in India. 5. Rice – This staple food from South East Asia has now been genetically modified to contain a high amount of vitamin A. Allegedly, there are reports of rice varieties containing human genes to be grown in the US. The rice will create human proteins useful for dealing with infant diarrhea in the 3rd world. China Daily, an online journal, reported potential serious public health and environment problems with genetically modified rice considering its tendency to cause allergic reactions with the concurrent possibility of gene transfers. 6. Tomatoes – Tomatoes have now been genetically engineered for longer shelf life, preventing them from easily rotting and degrading. In a test conducted to determine the safety of GM tomatoes, some animal subjects died within a few weeks after consuming GM tomatoes. 7. Rapeseed – In Canada, this crop was renamed canola to differentiate it from non-edible rapeseed. Food stuff produced from rapeseed includes rapeseed oi (canola oil) l used to process cooking oil and margarine. Honey can also be produced from GM rapeseed. German food surveillance authorities discovered as much as a third of the total pollen present in Canadian honey may be from GM pollen. In fact, some honey products from Canada were also discovered to have pollen from GM rapeseed. 8. Dairy products – It has been discovered that 22 percent of cows in the U.S. were injected with recombinant (genetically modified) bovine growth hormone (rbGH). This Monsanto created hormone artificially forces cows to increase their milk production by 15 percent. Milk from cows treated with this milk inducing hormone contains increased levels of IGF-1 (insulin growth factors-1). Humans also have IGF-1 in their system. Scientists have expressed concerns that increased levels of IGF-1 in humans have been associated with colon and breast cancer. 9. Potatoes – Mice fed with potatoes engineered with Bacillus thuringiensis var. Kurstaki Cry 1 were found to have toxins in their system. Despite claims to the contrary, this shows that Cry1 toxin was stable in the mouse gut. When the health risks were revealed, it sparked a debate. 10. Peas – Peas that have been genetically modified have been found to cause immune responses in mice and possibly even in humans. A gene from kidney beans was inserted into the peas creating a protein that functions as a pesticide. As early as 2008, NaturalNews.com reported about a condition called Morgellon’s disease. The article went on to report the symptoms of the disease as follows: crawling, stinging, biting and crawling sensations; threads or black speck-like materials on or beneath the skin; granules, lesions. Some patients report fatigue, short term memory loss, mental confusion, joint pain and changes in vision. Furthermore, there have been reports of substantial morbidity and social dysfunction leading to a dip in work productivity, job loss, total disability, divorce, loss of child custody and home abandonment. Prior to its reporting, the condition was dismissed as a hoax, but upon further investigation, the evidence pointed out that the disease was real and may be related to genetically modified food. When a research study was conducted on fiber samples taken from Morgellons patients, it was discovered that the fiber samples of all the patients looked remarkable similar. And yet, it did not seem to match any common environmental fiber. When the fiber was broken down, and it’s DNA extracted, it was discovered to belong to a fungus. Even more surprising was the finding that the fibers contained Agrobacterium, a genus gram-negative bacteria with the capacity of transforming plant, animal and even human cells. Morgellon’s disease is not the only condition associated with genetically modified foods. A growing body of evidence has shown that it may cause allergies, immune reactions, liver problems, sterility and even death. Moreover, based on the only human feeding experiment conducted on genetically modified food, it was established that genetic material in genetically modified food product can transfer into the DNA of intestinal bacteria and still continue to thrive. Monsanto Claims GMO crops are not harmful. This is the biggest lie in our world today. 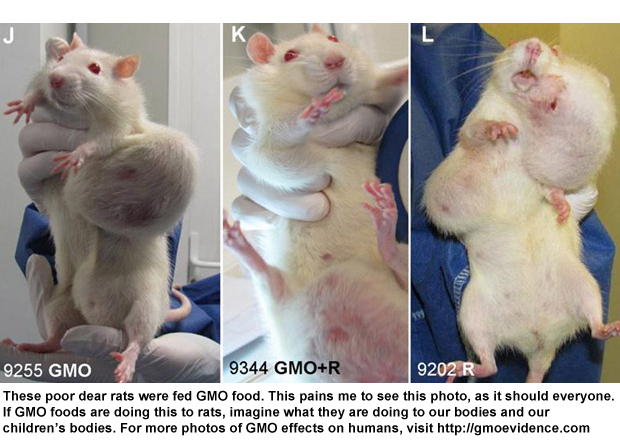 Below are photos of mice who developed tumors as a result of being fed GMO foods. I think it is important for the awareness of the dangers of GMOs to be understood by All. These poor dear rats were fed GMO food. This pains me to see this photo, as it should everyone. If GMO foods are doing this to rats, imagine what they are doing to our bodies and our children’s bodies. For more photos of GMO effects on humans, visit http://gmoevidence.com. Monsanto and other GMO companies are poisoning our earth, our water, our land, our bodies, our animals. We must act today to stop this atrocity! Petition your Senators and Congressman to mandate GMO labeling and stop supporting Monsanto. Time and again, the American Academy of Environmental Medicine (AAEM) has warned that GMOs pose a serious threat to health, and it is no accident that there can be a correlation between it and adverse health effects. In fact, the AAEM has advised doctors to tell their patients to avoid GMOs as the introduction of GMOs into the current food supply has correlated with an alarming rise in chronic diseases and food allergies. This should come as no surprise. More than 30 years ago a food supplement called L-trytophan killed 100 people and affected 5,000 to 10,000 more. The cause was narrowed down to the genetic engineering process used in its production. If the symptoms had not had three simultaneous characteristics – namely, they were unique, acute and fast-acting – the disease could never have been identified. If science could assure us with certainty that serious consequences do not wait for us at the end of the line, it might be to our best interest to let this opportunity pass. Progressive thinking in terms of profit is certainly not wrong. But to brush off precaution on the convenient argument that there is not enough evidence to prove that GM food is indeed harmful is sheer irresponsibility. It certainly is a lame excuse to offer in the event that GM foods are indeed proven to contain health hazards. 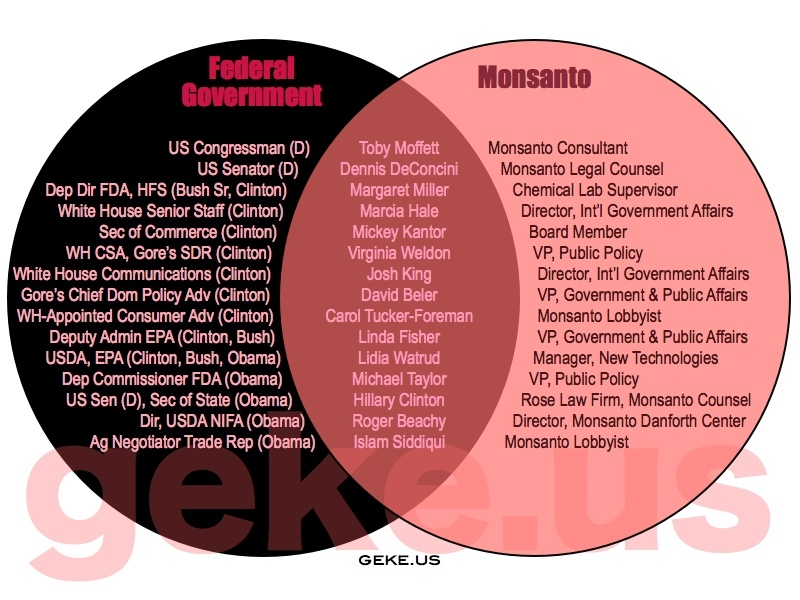 How bad is the revolving door between Monsanto and government? This handy chart (from geke.us) pretty much sums it up. Monsanto has been particularly talented at vacuuming up well connected ex-Congressmen, Senators and other government officials to go back and lobby the government, using their connections for the company’s benefit. And it also has been great at placing its own people into the agencies that are supposed to be regulating it. Taylor started off as a partner at the law firm that represented Monsanto on GBH issues (artificial growth hormones that make cows give more milk). Then, as the FDA’s deputy commissioner for policy, he wrote the FDA’s rBGH labelling guidelines – the ones that insisted there was no difference between rGBH and regular milk. He also deleted references to problems with GMO foods, over the objection of staff scientists. Then he spent a few years working directly for Monsanto. And now? Barak Obama brought him back to the FDA to oversee Monsanto again, as his food safety issues czar! More background: See our earlier story, Monsanto employees in the halls of government. 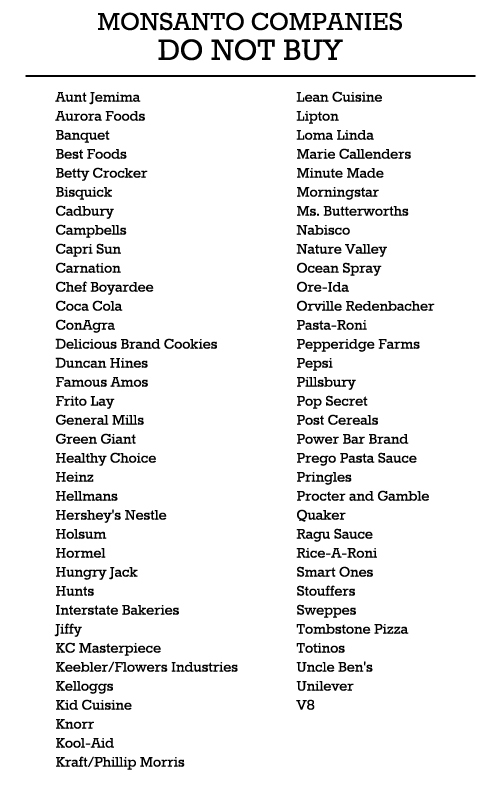 The companies listed below have signed the Safe Seed Pledge for 2012. Many of the GMO Seed Companies are owned by PHARMACEUTICAL COMPANIES. This should tell us something. Created in 1999, the Safe Seed Pledge helps to connect non-GM seed sellers to the growing market of concerned gardeners and agricultural consumers. The Pledge allows businesses to declare that they “do not knowingly buy or sell genetically engineered seeds,” thus assuring consumers of their commitment. 2250 N.E. Tahuya Blacksmith Rd. Alberta Nurseries and Seeds, Ltd.
Matchbox Garden & Seed Co. The research was spurned by the Brazilian Collegiate Board of Directors of the National Sanitary Surveillance Agency (ANVISA), who advocated in 2005 for evaluations of toxicity and pathogenicity of microbiological control agents such as Bt, given that little is known about their toxicological potential in non-target organisms, including humans. While Bacillus Thurigensis spore-crystals have been used since the late 1960′s in agriculture as a foliar insecticide, it was only after the advent of recombinant DNA biotechnology that these toxin-producing genes (known as delta endotoxins) were first inserted into the plants themselves and released into commercial production in the mid-90′s, making their presence in the US food supply and the bodies of exposed populations ubiquitous. What the new study revealed is that various binary combinations and doses of Bt toxins target mammalian cells, particularly the erythroid (red blood cell) lineage, resulting in white and red blood cell changes indicative of significant damage. Some of these adverse changes included anemia, and suppression of bone marrow proliferation and abnormal lymphocyte changes consistent with some types of leukemia. By Kaye Spector, ecowatch – November 21, 2013 | Thanks to Golden Age of Gaia. The Big Island of Hawaii has a new law that bans biotech companies, as well as all open-air growing of genetically modified organisms (GMOs). The bill exempts papayas and other GMO crops currently being cultivated and includes fines of $1,000 a day for violators. Mayor Billy Kenoi hasn’t indicated his stance on the bill, but he has 10 days to veto it. The county council could override a veto with a vote from six members. Supporters of the measure filled the council chambers at the West Hawaii Civic Center with applause after the vote late Tuesday, according to the Hawaii Tribune-Herald. “We are at a juncture,” Councilwoman Margaret Wille, who introduced the bill, told Honolulu Civil Beat. ”Do we move forward in the direction of the agro-chemical monoculture model of agriculture, or do we move toward eco-friendly, diversified farming? At least two farmers’ groups supported the measure—the Hawaii Farmers Union United, whose focus is on family farms, and the Kona Coffee Farmers Association. Farmers supporting the bill said they fear cross-pollination between modified and non-modified crops, which they say can hurt or even close their markets. Papayas were exempted in the Big Island bill because most of the 200 papaya plantations in Hawaii are planted with genetically engineered trees. A team of scientists modified the DNA of the papaya in the 1990s to withstand a devastating ringspot virus. Large biotech companies like Syngenta, Monsanto, Pioneer, Dow and BASF have long been experimenting with GMO crops and seeds in Hawaii. They have farms on the islands of Oahu, Kauai and Molokai, but they’ve never operated on Hawaii’s Big Island. The world’s biotech giants have set up shop in Hawaii in recent years, attracted by year-round growing conditions and an ecosystem favorable for testing and growing produce such as seed corn. The biotechnology industry has all but completely supplanted the sugar cane and pineapple industries that used to dominate the Hawaiian landscape. The Big Island bill comes just days after Kauai County Council overrode a mayoral veto on a bill that mandates disclosure of GMO crops. Anne Lopez, spokeswoman for the Attorney General’s Office, said earlier this fall that the office has no plans to weigh in on the Big Island’s proposed ban or challenge it if it’s adopted. “We have not analyzed it to come up with a legal opinion,” she said. In 2008, the county adopted a ban on GMO coffee and taro that has not been legally challenged.